What’s the best way to pay people not to rebel? The government created an innovative, ethnically-delimited asset – the bonds given to samurai — even while eliminating the privileges and obligations that had made this ethnic group distinct. It then took the ex-samurai, one [group] that was the most likely to engage in violence and enhance political risk, and gave them incentives to become local bankowners – a group with arguably the greatest incentives to avoid engaging in violent actions that would raise the political risk of their investments in local ventures (often rice and silk). By aligning the samurai’s interests against political risk, these financial innovations aligned their interests with not only the merchants who were their fellow merchant share-holders but society at large. Since all could benefit, and in fact the samurai had explicit stakes, as bankers, in the nation’s future, they also meant that the samurai could give up their arms and credibly share the gains that modernisation and reduced political risk provided. This process also produced a truly phenomenal photo of samurai-turned-banker Eiichi Shibusawa, who’s known as the father of Japanese capitalism for his role in founding the Tokyo Stock Exchange and a number of other publicly held companies. What I find fascinating here is the ways in which this process is both similar to and different from current debates about post-conflict power-sharing in Africa. The idea behind consociationalism is that placing representatives of all contesting groups in power ought to give them a common interest in maintaining the stability of the state. This appears to have worked out relatively well in Burundi for the last ten years. Lemarchand is explicit about Bujumbura’s focus on maintaining interethnic stability even at the cost of good governance: “[the administration is] a top-heavy political machinery whose sole purpose is to provide as many jobs as are needed to meet the requirements of political stability. The government is not meant to govern; its purpose is to offer an attractive alternative to rebellion” (2009, p. 149). In a sense, then, this is simply a less efficient means of accomplishing what the samurai bonds did in Japan. However, institutionalized power-sharing has often failed in Africa as well. The prime case here is obviously the DRC, where the 2002 power-sharing accords got most – but not all – of the major rebel groups durably off the battlefield. The Nkunda- and Ntaganda-centric set of groups which continually rebelled in the east were largely spurred on by Rwanda, but also presumably believed that they might get a better deal out of some future peace agreement. Would a different benefit structure for ex-rebels – shares in banks as opposed to positions in the government – have led to a different outcome? The Congolese central bank has been issuing bonds for several years now, and the banking sector is badly underdeveloped, so promoting investment (and of course concomitant regulatory mechanisms) there might indeed benefit everyone. If readers have other examples of the strategic use of financial instruments to promote political stability, I’d love to hear about them. present. It’s good to come across a blog every once in a while that isn’t the same unwanted rehashed information. Fantastic read! Comparing Africans to Japanese is a bit rich, though no doubt an increased focus on stability and making talented groups into stakeholders rather than squeaky clean concepts of “governance” (or God help us, “development”) would benefit states lacking legitimacy, particularly those burdened with ethnic diversity. I can think of a similar example from a former Japanese colony: Taiwan. Following Chiang Kai-Shek’s defeat on the mainland, he installed himself as autocrat of Taiwan. One of his major reforms intended to modernize the local economy was land reform. Rather than expropriating the old landlords outright, the landlords were given state bonds and shares in former Japanese-owned enterprises. The old landlords become Taiwan’s industrial and financial capitalists, and Chiang’s rule was never seriously threatened. For all we know he got this idea from studying Meijii Japan. 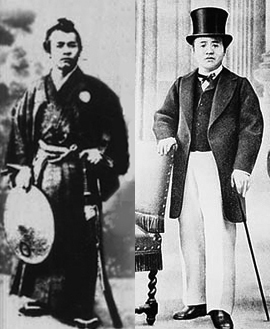 Chiang had after all studied in Japan as a young man. An interesting read not least because it looks at historical examples from before the last century for inspiration.